Bastien! Bastien! Bastien! If he can't do it noone can! Your work is much appriciated and looked forward to! Meanwhile.. my windows system at work just craped out trying to deal with a sony ericsson and a nokia device at the same time. Woo-hoo ! Rock on, dude ! It's great to see decent Bluetooth support appearing in Gnome at long last. Thanks and keep up the good work! Congrats. Sadly, gnome-user-share is outdated in Debian. just a question... if you can't port gnome-vfs-obex to gio in time for 2.22, does that mean that there won't be any bluetooth browsing possible in nautilus in 2.22? Yep, no gnome-vfs-obexftp port means no ObexFTP browsing in 2.22. Adam, step 1 is to install Fedora, step 2, follow the guide on the Fedora wiki. Seems with the new gnome-bluetooth and bluez-gnome's applet running I can successfully find the computer from my phone and pair with it. But when I try to send any file from phone to PC, it says it can't find any devices. Yes, I set discoverable in the Bluetooth applet. 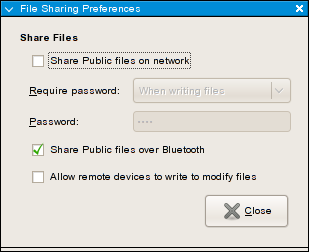 Is gnome-user-share really required just to receive a file that the phone is trying to push? It seems unnecessary. And I'm fairly sure this used to work somehow. All other bits (gnome-bluetooth etc) got updated today too. So it's only not there if this stuff is still only in SVN / Fedora-specific patches, not in the latest tagged releases. Is bluetooth-sendto a command that can be used from the command line like gnome-obex-send today? I hope so at least. All I can say is: GO GO GADGET OBEX GO!! !